A few weeks ago, as part of my holiday, I was lucky enough to visit the Danish Design Museum in Copenhagen. It was incredible! 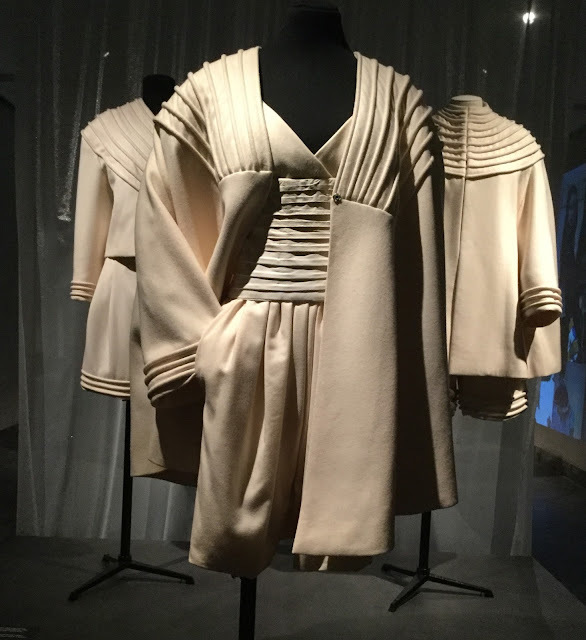 They had two fashion exhibitions on, one permanent one called Fashion & Fabric and one named I am black velvet, (which is there until January 28th 2018) about the haute-couture designer Erik Mortensen. Both were really good. I took a lot of photos (it was really hard to narrow them down to just these!) and I wanted to write about as it was really a very good exhibition. Starting with the Fashion & Fabric exhibition, this dress was the first one that caught my eye. I love the elaborate sleeves, it must have looked stunning being worn down a cat-walk. 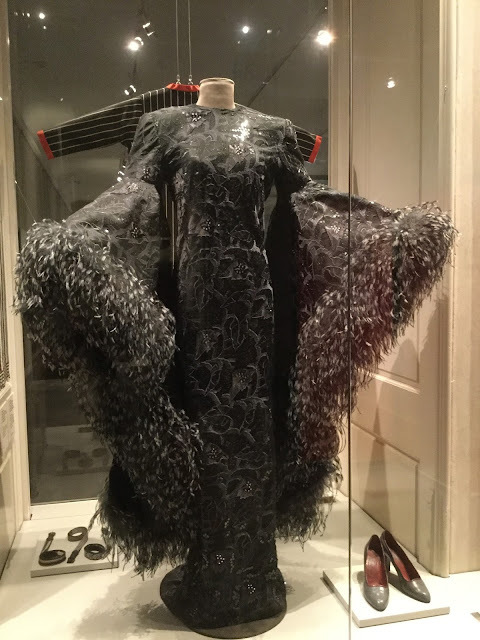 This was an evening dress designed by Erik Mortensen in 1986. The sleeves are made from artificial ostrich feathers, and the dress is covered in sequins and rhinestones. Looking at fashion sketches are one of my favourite things to see at fashion museums. 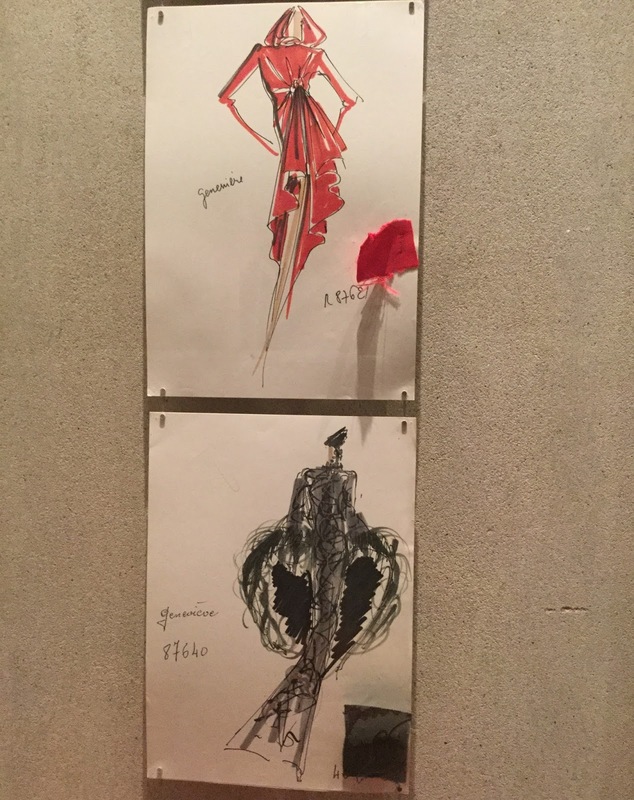 I love seeing the dresses drawn and then created. The sketch in the bottom right is of the dress above, it's amazing to thing that something that started as pen on paper finished as an incredible garment. The next dress is a wedding dress made out of silk. I love the close up shot of the embroidery - so much detail! It's amazing. 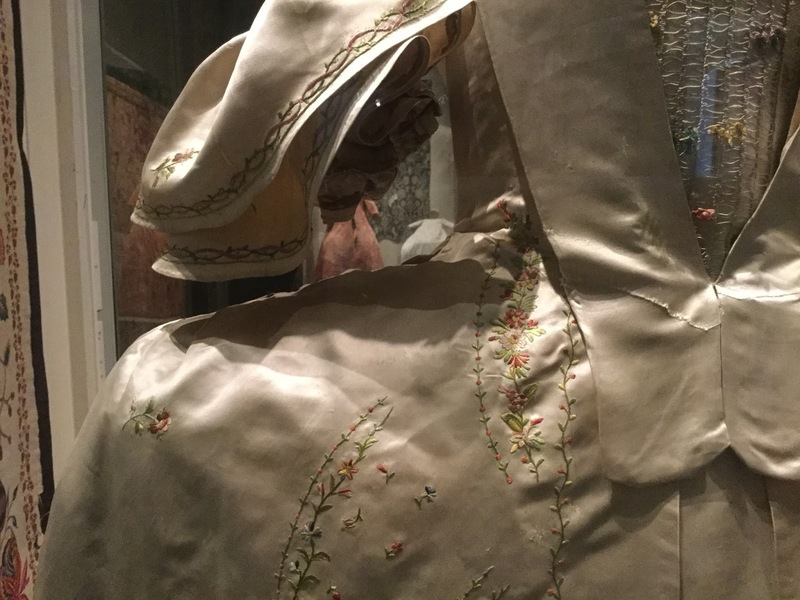 The dress must have taken so long to make, and the embroidery is exquisite. 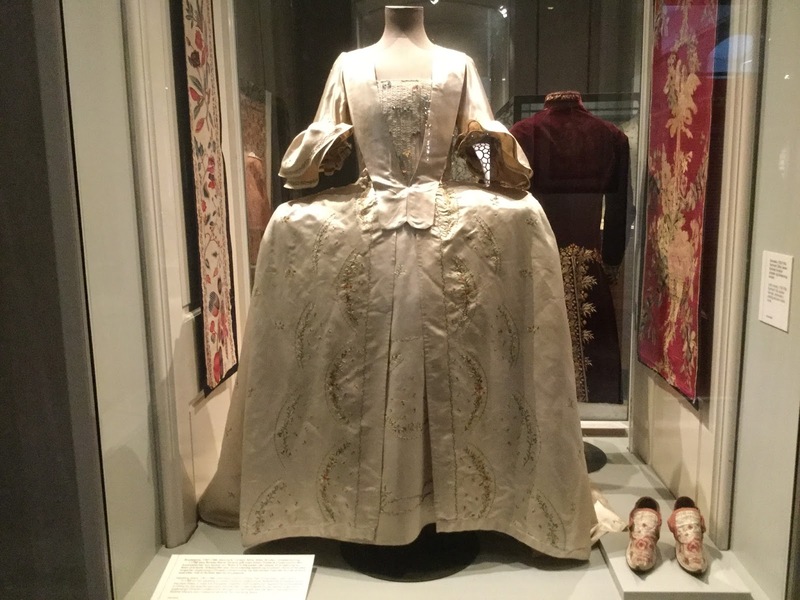 I also love how this was worn in 1768 and I was looking at it 250 years later! Moving on to the I Am Black Velvet exhibition. 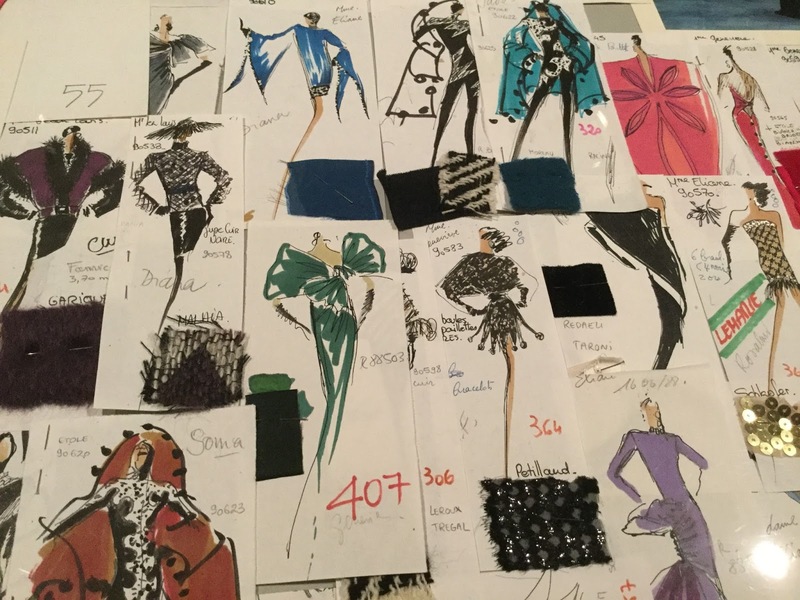 These are all designs from the haut-couture designer Erik Mortensen. A lot of his works were in black, hence the name of the exhibition. 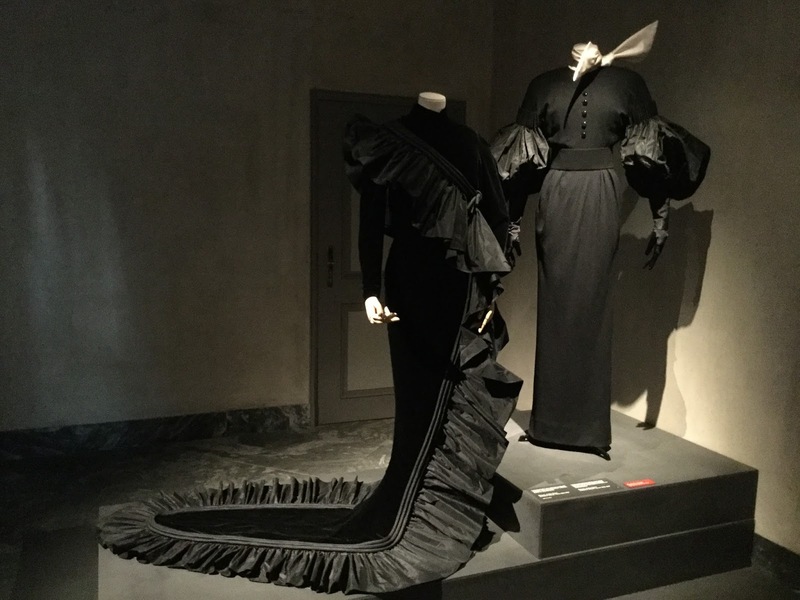 These two dresses are made from black silk and velvet. I like the long train surrounded by ruffles, it hangs really nicely. 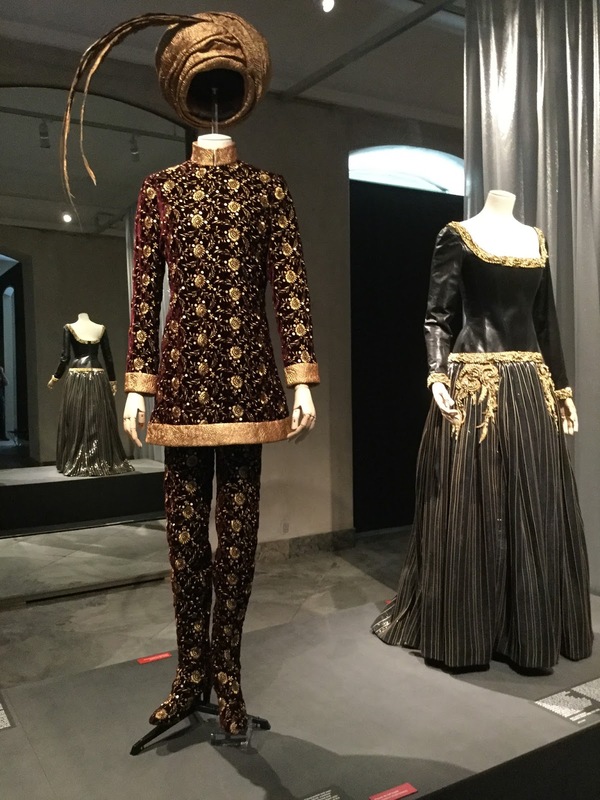 These two outfits caught my eye because of the metallic gold machine embroidering. The first is a long jacket with trousers and boots, complete with a turban. The whole outfit left me completely in awe. The dress next to it is another incredibly intricate design, adorned in gold ribbons and beads. These outfits are made from off-white wool. They are trouser-dresses with jackets and wide belts. The jacket's yoke is decorated with rouleaux and the belt is made of glove leather. I particularly like the details on the cuffs. The next two dresses are long evening dresses made from silk satin. 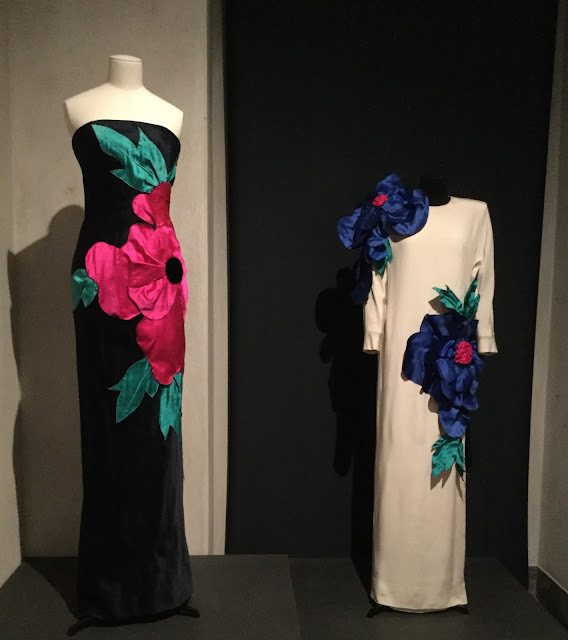 The appliquéd flowers are slightly crazy yet still strangely elegant. I love the shape of the black dress, and the bright colours are lovely. 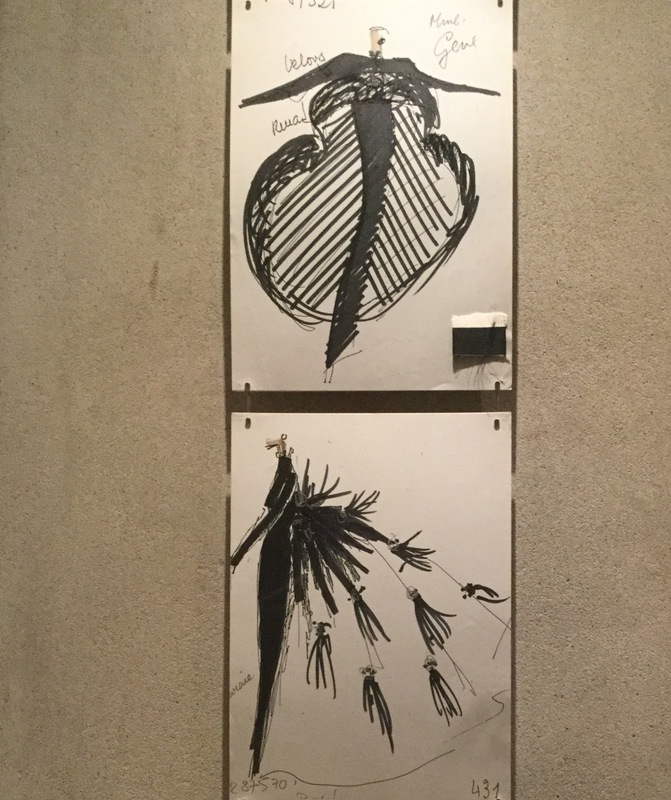 Finally, a few more sketches, selected from a few of Mortensen's collections. It was really an incredible exhibition to go to, if you have the chance I would highly recommend going. The Design Museum also has lots of other exhibitions, there will definitely be something for everyone. Thank you for the fascinating pictures. This was wuch an interesting post! Wow! Thanks for sharing; very beautiful.